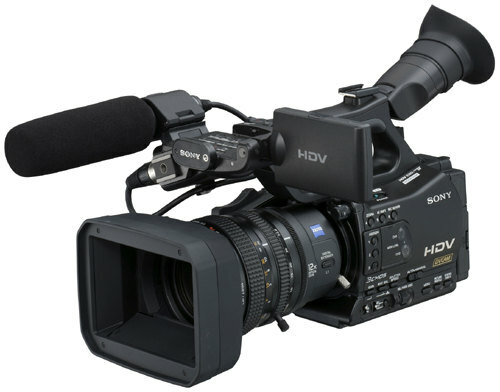 Sony has responded to professional user feedback to create the ideal handheld camcorder with ergonomically designed body-weight balance and a well-planned layout of buttons and connectors to reduce camera operator fatigue. The Memory Recording Unit is supplied with each camcorder to support HDV tape recording. It captures the HDV1080i, DVCAM, or DV stream output from the camcorder and records it as movie file while you are simultaneously recording to tape. You can use a standard CompactFlash (CF) card*, which offers secure recording, high-speed access, large data capacity, removable media convenience, and high durability against external vibration. Uncompressed digital HD video and audio signals are output from the HDMI connector. You can see stunning HD images on the HDMI-compatible monitor display. During shooting, the pre-compressed 1920x1080i/4:2:2 signal is output from the HDMI connector. The HVR-Z7U features two accessory shoes. There is a cold shoe on the front that can be removed to make room for a mattebox. While at the rear, there is a screw-hole type shoe located on the handle, which can be changed to a cold shoe, if required, using supplied parts. The HVR-Z7U uses the same batteries as the HVR-Z1U, HVR-V1U, and DSR-PD170, so you can fully utilize your existing battery and charger assets.